I quite enjoy writing these 'snapshot' posts of things I am using at the moment-the only problem for me is keeping them as a snapshot and not rambling on and on...but I'll try. First up is a moisturiser I bought when I was in Vegas last year and it was my first Dr Dennis Gross product. I've just actually finished this up and it was quite a nice moisturiser-especially if you live in a hot climate or have oily skin. The moisturiser is more of a light gel formula and reminded me of Origins Ginzing and it feels hydrating without being overbearing on the skin. My hormonal acne prone skin always prefers gel/water based formulas to creams so this was the perfect light, non greasy solution. The formula contains Hyaluronic Acid which keeps moisture locked into skin, Glycolic Acid to improve tone and texture, Aloe to soothe and Collagen to plump and firm. I do think I prefer the Origins Ginzing and I probably wouldn't repurchase this particular product. It was just nice, not wow. Next is a much hyped up in the bloggersphere product and it's the Nivea for Men sensitive aftershave balm which I picked up from my local supermarket. Nikki Tutorials started this trend of using this as a primer because it's main ingredient is glycerin which helps make up 'stick' to it, meaning your make up lasts longer. I use a version produced in the Middle East so I don't know if the ingredients differ to that in the UK/US but I struggle to get this product to go 'tacky' which is the main tip given-rub into your skin until it goes tacky, which I guess means the glycerin is activated. However, that being said, I have been using this a lot as a moisturiser/primer hybrid. It's very liquidy so I tip a 10p piece size out and then rub into my face and make up does apply nicely over it. I've had no problems with it breaking me out but again I have not been wowed by it-I don't notice a huge difference in the longevity of my make up when I use it. Next up is the NARS Sheer Glow. I have used NARS Sheer Glow before and I really liked it. I repurchased it and this time I just didn't feel at first like it was doing anything for me on its own. So I tried amping up the longevity and coverage by mixing it with Estee Lauder Double Wear. I found this gave a much higher coverage finish than just using Sheer Glow on it's own but by mid afternoon I did find that there was a lot of settling into pores at the bottom of my cheeks and forehead. But this last week my skin has been a lot better and so I have been using this alone and really liking it! Medium coverage, no settling into pores, a satin finish on the skin. 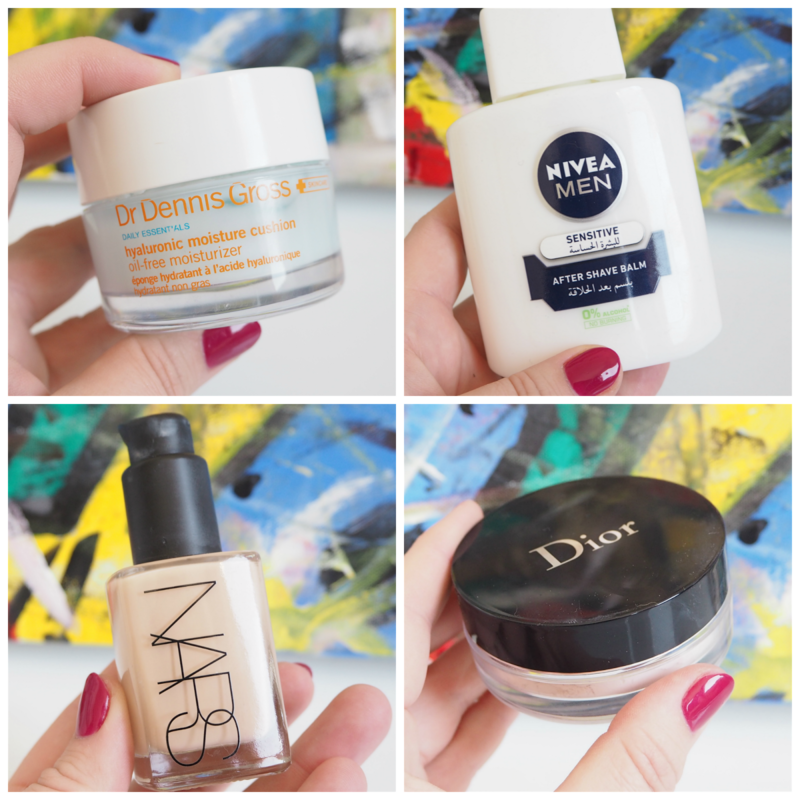 I've been using it on top of the Nivea 'primer' and I have been much happier with it. Finally, a newly launched product from a brand I love but initially I really hated it-and yet people were raving about it. It's the Dior Forever and Ever Control loose powder. I was so excited to try this as I had heard amazing things but I felt like when I used it, it looked like sand on my skin. No matter how I applied it, my face looked 'gritty' and it seemed to sit on my skin. I also hated the packaging-the cushion protecting the powder makes it really difficult to dispense the powder and the fact the lid sits 'into' the powder is great for travelling as it means the powder is prevented from escaping and spilling everywhere, but you can't tip the powder into the lid so you have to press your brush directly onto the cushion to try and get the powder out and oh it's just such a faff. But.....every review I read was really positive so I went back to it to retry and now I actually kinda really like it. My personal tips for applying it are: use a very dense powder brush and hold it upright and tap the cushion directly onto it to dispense the product and then press the powder onto your skin. By pressing it in you don't get the 'sand' effect and the powder does instantly 'blur' your skin which is quite a nice effect. It also does keep me matte longer than anything I have used recently. It is a universal shade so adds no colour but I do wonder if this will be too pale for darker skin tones. I also recommend you don't use this under the eyes as it makes your skin look very dry and crepe-y. I was sure this was getting blog-saled but it can stay for now. And I am glad I gave it a second chance!